GDT Hikers must stay in designated campgrounds in most National and Provincial Parks so it is recommended that you arrange for all park permits in advance. Outside of National and Provincial Parks, permits and reservations are not required on the GDT. Parks Canada Discovery Pass: Covers access to National Parks, campground fees are not included. Go to the Parks Canada website for more information. National Park Backcountry Permits require a reservation with a complete selection of all backcountry campgrounds to be used on your trip, and are subject to campground availability. National Park backcountry campground reservations cost $11.70 (one time fee in addition to Backcountry Permit fees). All national parks along the GDT now accept online reservations (reservation.pc.gc.ca) with the exception of Waterton Lakes National Park. Ensure you have created a ‘My Parks Canada Reservation Account’ in advance of reservations opening. Thru-hikers planning a long-distance trek through multiple national parks are recommended to reserve campgrounds online where available and then if necessary, call each applicable national park office to complete other required campground reservations (including random camping locations) and get any duplicate reservation fees reimbursed. Random camping is allowed on the following sections of the GDT within National Parks but a Backcountry Permit (random camping permit) is still required: Amiskwi valley in Yoho; Howse Pass Trail and Owen Creek Trail in Banff; Miette River/Pass Trail, Calumet-Moose Pass Trail, 6-Passes Alternate and Elysium Pass Alternate in Jasper. You must call a national park office directly in order to obtain a random camping permit as they are not available online. For changes en-route, visit a Parks Canada visitor centre or a Backcountry Park Warden may be able to revise your Backcountry Permits. For more information, check out the Parks Canada website. Three Provincial Parks require backcountry campground reservations. Hikers planning a long-distance trek through multiple parks will have to make all required campground reservations separately. Backcountry campgrounds reservations are available up to 90 days in advance online, or in person at the Peter Lougheed Visitor Information Centre – $12 per person/night + $12 reservation fee. Reservations are required during peak season (June 26 – September 30) for all overnight stays at Magog Lake and Og Lake campgrounds. All other campgrounds in Mount Assiniboine Provincial Park are first-come first-served. Reservations can be made up to 4 months in advance of your arrival date via the BC Parks Discover Camping Reservation Service – $10 per person/night + $6 reservation fee. Reservations for the 2019 hiking season opened October 1, 2018. All backcountry campgrounds on the Berg Lake Trail in Mount Robson Provincial Park are 100% reservable from June 12 to September 30, 2019. Online reservations only – $10 per person/night + $6 reservation fee. Permits and reservations are not required for backcountry campgrounds along the Moose River in Mount Robson Provincial Park. 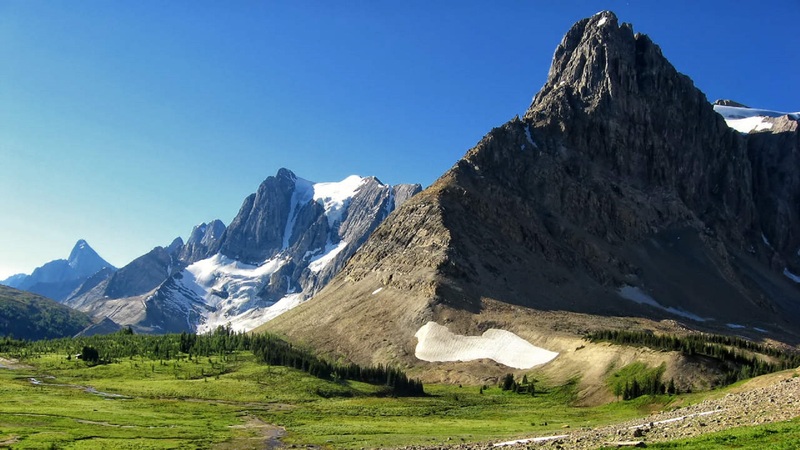 All other Provincial Park backcountry campgrounds do not take reservations and have first-come first-served self-registration ranging from free to $10 per person/night. For a list of campgrounds on the GDT check out our Campgrounds page.